It is time for Roman Catholic Womenpriests in Ireland. At this threshold of both hope and anxiety in Ireland, we can reclaim our wisdom fgures from our ancient Celtic tradition as guides in this time of transformation for the Roman Catholic Church. As an Irish-born woman and Roman Catholic womanpriest, I have great passion for my faith and heritage. I wrote a book and produced several television programs on Celtic spirituality. Here is one of the insights I discovered that uplifted me and grounded me in the Celtic Christian story of faith and experience of equality in Christ. Bishop Mel, Patrick's nephew, ordained St. Brigit of Kildare a bishop. The partnership and equality of women and men can be seen in the double monastery system. Both Brigit of Kildare and Hilda of Whitby founded monasteries in which women and men lived. Some believe that Ita's foundation in Kileevy was a mixed community. These monasteries settlements,referred to as conhospitae or double houses, included women and men, some of whom lived a celibate life while others were married couples with children, but all living as a Christian community, having dedicated their lives to Christ. All, whether married or single, were referred to by a term that translates as "religious. Thus, in this partnership model of women and men who served in priestly ministry serves as model for the renewal of priestly ministry not only in Ireland, but elsewhere as well. According to this article, some priests, parishes and dioceses in Ireland are planning to hire the people in the community to do pastoral work. This is an important step forward from a clergy dominated model of church to a people empowered community of believers. However, according to the canon law of the church, all decision making is reseved to the clergy. Therefore,unless there is structural change in the church, these pastoral workers will not be on an equal footing with the parish priest or bishop, and this can result in dismissal and firings at the whim of the clergy in charge. This has been the unfortunate experience of pastoral ministers in the United States. Approximately 80% of pastoral work is performed by women in the United States. Roman Catholic Womenpriests believe that we must have an equal playing field in the service of the community. Our vision and practice incorporate the people in our communities as equals. We are called to serve with the people in a community of equals modeled on example of Jesus who called women and men to be disciples and equals. The institutional church must move from a power over model, a dominator model to an empowerment model where we have a truly empowered community working together in a collaborative effort to celebrate the Christ Presence in our midst.Roman Catholic Womenpriests are offering the church a renewed model of priestly ministry that is rooted in partnership and equality-- similar in vision to early Celtic Christian model of a Christ-centered, Spirit-empowered community in the local church. Regarding "The Problem With Liberation Ordination" by Kathryn Jean Lopez (Houses of Worship, Aug. 22): Roman Catholic Womenpriests have not aligned themselves with a tradition that has a sister "declaring the Eucharist 'defective and inadequate for women' " -- quite the contrary. The Eucharist has always been the major focal point of the Roman Catholic Womenpriests movement and our inclusive Christ-centered ministry. Does women’s ordination challenge the sin of sexism practiced by the Vatican church? the week of August 25/08. On August 9th Roy Bourgeois, a Maryknoll priest and the founder of the School of the Americas Watch, concelebrated and gave a supportive homily at the priestly ordination of Janice Sevre-Duszyinska in Lexington, Kentucky. Immediately, the Vatican pressured the superiors of the Maryknoll community to condemn the actions of their much respected priest. What would the Maryknoll superiors do? Would they act as did the Benedictine Sisters in support of Sr. Joan Chittister in 2001? At that time, she transgressed John Paul II’s edict of silence, first by attending and then by speaking positively about the ordination of women at the Women’s Ordination Worldwide conference in Dublin, Ireland. Within days, an extensive campaign of support for Roy Bourgeois urged the Maryknoll superiors to stand by their contemporary justice prophet. On August 19, the National Catholic Reporter (NCR) published the latest news (http://ncronline3.org/drupal) about Maryknoll’s seemingly positive meeting with Roy Bourgeois. It appears that the religious congregation is prepared to stand with him in their willingness to “urge” a continuing dialogue about the place of women in the Church. One hopes that this will include the ordination of women. However, Roy Bourgeois has been warned not to attend any more RCWP ordinations. That may not be necessary. His homily of justice towards women in the RC Church cannot be erased from the historical record, any more than Chittister’s talk in Dublin can be suppressed. As of this writing, the Vatican’s excommunication “latae sententiae” has not been applied to Fr. Bourgeois. Nevertheless, it was quickly imposed on Sister Louise Lears, a Sister of Charity of Maryland, for attending another RCWP ordination in St.Louis, in November 2007. There, she was seen on a camera operated on behalf of the diocese. Are the Vatican’s responses to men in religious orders different than women in religious congregations and are they different from censures of diocesan priests? Over time, the import of these contradictory responses may become clear. Meanwhile, it is necessary to question and search for answers. It is now less than 3 months when the Vatican issued the automatic or blanket excommunication of all RCWP ordained deacons, priests and bishops. 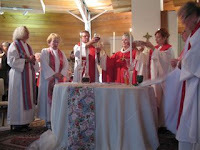 It was published on May 29th, the day for the ordination of Monica Kilburn-Smith and Jim Lauder in Victoria, BC. It did not dampen the joy of the celebration presided by bishop Patricia Fresen together with an eager gathering in the United Church of St. Aidan’s on Vancouver Island in Canada. We had now embraced the third ordained Roman Catholic woman priest in our country, as well as the first RCWP male ordained to the priesthood. 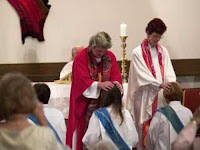 In this inclusivity, the issues surrounding sexism in the ordination of women are somewhat blurred; however, the fact that a male was willing to stand and undergo the same penalty with us, modeled what may someday become a non-clericalist, non-sexist priesthood as we envision it currently in RCWP. For the moment, I learned that it is still hard to see and take in the deeper significance of the ordination of women. Who are we in the sanctuary and around the table of worship? The answer is multi-layered and, as with other crucial issues pertaining to the ordination of women, will be unfolded over time. What has become clear since 2005, when the first women were ordained RCWP priests in North America, is that we are emerging with the People of God who, in the majority, believe that women should be ordained. This majority rejects the Vatican’s continued refusal to ordain women, and many understand that we have moved beyond words, alone. Instead, we are taking action on this issue of justice for women in the church. People come to the ordinations with joy and they are invigorated with hope because of them. Nevertheless, the Curia’s continuing ”NO” enhanced by the penalty of excommunication raises issues about the justice and credibility of such a publicly excluding practice. Women’s ordination holds up a mirror to the systemic malpractice of an unjust law and gradually, as we pursue this issue in the realities of sacramental and pastoral practice, we uncover how this denial of another’s basic human rights has affected us all. It would seem that in public censures and in resistance to reasonable change, the Vatican church understands its power to be that which binds more than that which can loosen a long held but now unacceptable belief. A deep fear of acting in the freedom and fullness of the life of the Holy Spirit has set in. Instead of creating the possibilities for evolving with the signs of the times, we have a backward looking resistance to change. It is possible to conclude that this fear is driven by the loss of an authoritarian power accustomed to determining action. rights and justice issues not just in the larger global societies, but within the Church of their heritage. Many reject Vatican definitional practices that are contrary to what they know from their knowledge and experience to be true. This puts them in a crisis of conscience where they often have to choose what is contrary to Vatican imperatives. going ahead with valid but illicit ordination in RCWP. It is neither a mystery nor confusing to justice oriented Roman Catholics to see this manifestation of womepriests. Canon law is an excessive use of authority not only against the ordained women but also against the ‘sensus fidelium’ where the wisdom of the Spirit ultimately resides. When understanding evolves such that there is no turning back, then an idea and practice has likely outlived its time. In the case of denying ordination to women and then punishing those ordained ‘contra legem,’ we now have a practice that represents the sin of sexism and more particularly, clericalism. Women who now seek ordination and/or leadership in the church are not recalcitrant children to be chided and sent to their rooms, until they repent their disobedience to an outraged parent. Nor is anyone among the People of God recalcitrant who, for reasons of conscience, disobeys unjust laws. Rather, these persons take a stand in prophetic obedience or holy disobedience. This has been a way of serving God that pre-dates Christianity and it is a tried way of being in the church community that carries validity in our Roman Catholic tradition. Thus, one might be led to question the practice of excommunication itself that dismisses and excludes someone without permitting their questions and their answers to be heard through fair representation. A practice such as excommunication is outside the realm of law in all democratic countries. One might conclude that it has become an outlaw practice and that it should be relinquished by a Church claiming to represent the prophetic way of Jesus, who excommunicated no one, not even his betrayer. Given the knowledge of the People of God, who are more advanced in understanding freedom and justice than in any other time of history, the practice of excommunication is now difficult to identify except in recognizing suffering in the most oppressive circumstances of life. It is extremely threatening for those who work in church contexts and who can lose their jobs and livelihoods for expressing dissent. The practice represents an outdated monarchical relationship with subjects who, if they offended the king or queen were imprisoned and executed. Now it is an instrument of spiritual intimidation and abuse not just of an individual, in their conscience, but of the entire Body of Christ. Redressing the effects of patriarchal authoritarianism and sexism is just what women and other justice seeking persons care about in seeking ordination at this time. They wish to address the deep violations enacted upon them as the People of God. The Danube seven said it best when answering the first edict for the excommunication of Roman Catholic Women Priests in 2002. They responded swiftly to the curia’s formal letter delivered by hand and pushed directly under the front doors of their homes .Dr. Gisela Forster of Germany still describes the day when the envelope with the red writing appeared. At first she thought it was an advertisement until she saw the magisterial print. Then she knew that the arrival of a momentous decision had taken place by stealth. All seven women priests wrote their response to the Vatican in familiar, rather than in abstract ecclesial language, and they wrote it together. Their words are open for all to read on their website ‘Virtuelle Dioeceze.’ The reply is relevant to all who have been persecuted because of disagreements of conscience seen as disobedience. One is struck by their words in a directive plea revealing a firm response to authoritarian behaviour. They say, “Don’t be obstinate. This must stop.” These words imply that the capacity to end the practice of excommunication and to examine existing unjust Canon laws is possible and within the powers of Church leaders. As with the Danube 7, is it possible for us, in the priesthood of the people, to question our practices of the sin of sexism and to take accountability for it and for its effects? Although the energy of sexism has been driven by clerical authority in our Church, it belongs to all of us insofar as we are the Church. 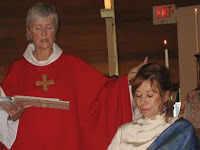 In the photo above, Bishop Dana Reynolds prays the Prayer of Consecration over Janice Sevre-Duszynska on Aug. 9, 2008 at her priestly ordination in Lexington, Kentucky. An official from Google News invited me to write this article on Roman Catholic Womenpriests for publication in July 2008. The official stated that Google News noticed that there were a great number of articles on the Boston ordinations indicating media interest from around the world. They wanted our perspective on the movement and invited the ordinands and me to write a commentary. Thus, Judy Lee and I published an article in response to the invitation.However due to some technical difficulties, the article only stayed up for one day. In August, they invited me to write again. So this time, we linked the article to the Kentucky Ordination of Roman Catholic Womanpriest Janice-Sevre Duszynska. The National Catholic Reporter published the news of Maryknoll Fr. Roy Bourgeois's homily and the call of Maryknoll to initiate a dialogue on the issue of justice for women in the Roman Catholic Church. My updated article is now up on the Google News site for 30 days according to the Google News Division. The moral to the story is to never give up!